The Terrace was a nice feature and the front desk and cleaning staff were amazing. I absolutely love this place! Awesome experience, bed was comfortable, and the view was exactly what we wanted. Overall rating 10. We were able to upgrade to a suite everything you wanted, and needed was in walking distance. Definitely my place to stay when we are in Vegas! Highly recommended. Great hospitality and ambiance; exceeded expectations.! Didn't like how long it took to retrieve some soiled towels left in the hallway/ It was a bio hazard. This hotel was absolutely amazinh, I was throughly impressed! Room was enormous and beautiful. They upgraded me for free, so I got a lovely Japanese soaking club and my own balcony. I also think they have the best food option of all the hotels on the strip. Balconies have best views of Vegas! Suites are incredible. Super classy! Great luxury excellent service, close to everything! Located in Las Vegas Strip, The Cosmopolitan Of Las Vegas is next to popular attractions like Crystals at City Center and Miracle Mile Shops. This 3041-room, 5-star resort has 3 outdoor pools along with a full-service spa and a casino. There are ample dining options with 20 onsite restaurants, including Estiatorio Milos, which specializes in Mediterranean cuisine. Satisfy your hunger without leaving your room with 24-hour room service, or quench your thirst with a beverage at the bar/lounge or 3 coffee shops/cafés. Buffet breakfast is offered for a fee each morning from 8 AM to 11 AM. Guests can expect to find 54-inch a flat-screen TV with cable channels and Netflix, along with free WiFi and wired Internet. Pillowtop beds sport Egyptian cotton sheets and down comforters, and the bathroom offers a hair dryer and free toiletries. Other standard amenities include a minibar, a laptop-compatible safe, and a phone. 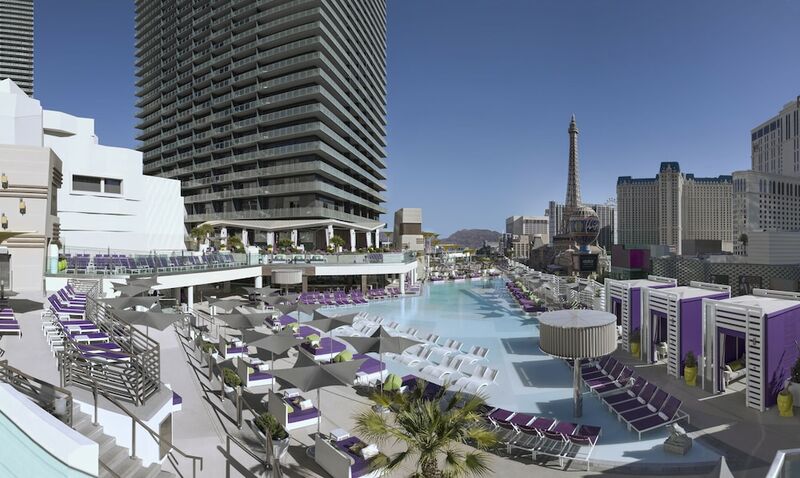 The Cosmopolitan Of Las Vegas features a full-service spa, 3 outdoor pools, and a casino. Free valet and self parking are available—or if you're not driving, take the airport shuttle (available 24 hours). The front desk has multilingual staff on hand 24/7 to help with securing valuables, concierge services, and dry cleaning/laundry. Other amenities at this luxury resort include a nightclub, a health club, and 3 spa tubs. Buffet breakfast is served daily from 8 AM to 11 AM for a fee. Estiatorio Milos - Restaurant and bar specializing in Mediterranean cuisine. Open daily for lunch and dinner. Reservations required. Scarpetta - Restaurant and bar specializing in Italian cuisine. Open daily for dinner. Reservations required. STK - Steakhouse and bar specializing in American cuisine. Open daily for dinner. Reservations required. Jaleo - Restaurant and bar specializing in Spanish cuisine. Open daily for lunch and dinner. Reservations required. Holsteins - Restaurant and bar specializing in American cuisine. Open daily for lunch and dinner. The Cosmopolitan Of Las Vegas features outdoor tennis courts and a health club. The resort has 3 outdoor swimming pools and 3 spa tubs. Other recreation options include a sauna. Guests under 18 years old are not allowed in the swimming pool, health club, fitness facility, or spa tub. The front desk is open 24 hours a day, and checking in and out are easy with express services. For convenient arrivals and departures, you can take advantage of the airport shuttle (available 24 hours), which is offered for a fee. Driving? This property offers free parking. 24-hour airport transportation is available at scheduled times. Fees may apply. Guests can contact the property in advance for details. Guests booked in any Breakfast Included rate plan receive 2 complimentary breakfasts at Wicked Spoon per stay/reservation. Added costs apply for any additional breakfasts beyond the 2 per stay/reservation. 24-hour airport shuttle service is available at scheduled times at an added cost. Contact property concierge or McCarren airport for more details and to make arrangements. Guests traveling with a animal must contact the property prior to arrival. Contact the office using the information on the reservation confirmation received after booking. Book a stay for travel now-August 31, 2019 in a rate plan displaying the “USD 150 food and beverage credit” tag and receive USD 150 food and beverage credit valid for food and beverage only and not valid at select outlets, including zuma, Beauty & Essex and The Juice Standard, credit applied off of room folio. Book a stay in any rate plan displaying the "USD 100 food and beverage credit per room, per stay" tag from now - May 31, 2019, for travel now - November 30, 2019, and receive USD 100 food and beverage credit per stay redeemable at Wicked Spoon restaurant.